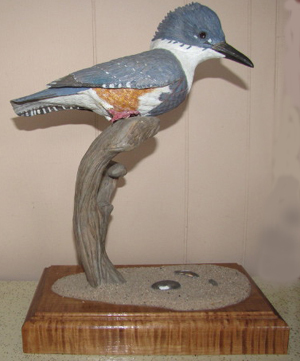 Herb Haines, 61 years old, carves birds! Mostly raptors and songbirds. He lives in a home built by his family over a century ago, one of those massive rural New Brunswick family homes where generations of his family have lived. These houses are plentiful in the Maritime’s, reflecting a past of enormous, extended families, now vanished. Herb’s family split the house in too many years ago, now he lives 30 yards from the old house, in a section moved across the property. Where there were many, now there are three, occupying both buildings, with the old house largely closed off, heating only a few rooms. The yard is stacked with fire wood waiting to be split, a ramp leads up to the door. In a front parlour, Herb and his mother (Elsie) pass the day in a companionable, convivial space. Herb carving, and chatting with Elsie, a television humming in the corner, a view of the St. John River for continuity. Elsie is 87 this year, and Herb is her caregiver, supporter and friend. 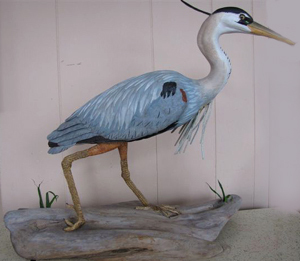 The work comes from this place, Herb’s love of the he outdoors, and his easy access to the fields and forests immediately behind the house means a firsthand experience of the birds he carves. And there are many. 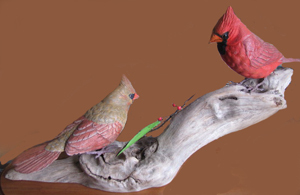 The carvings possess a delicate possession of the bird spirit, capturing the look and life of the subjects, a transference that can come only from long study and appreciation of the birds he portrays. 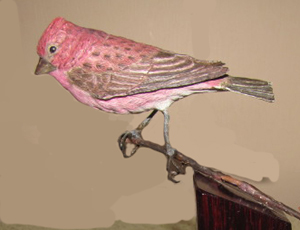 “It amazes me how I can take a piece of wood and find a bird in it . The feedback I am getting from people sure boosts my ego and shows me that I am doing something right . 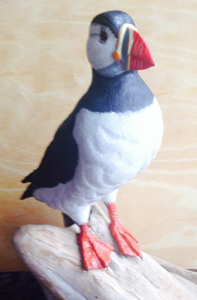 Herb has a number of pieces for sale, and is accepting commissions for delivery in late 2015. You can reach Herb through Caotica.com, just drop us a line and we will put you in touch.